Part I: Optical properties utilized by the new Micro-OTDR ORL/SNR Measurement feature. The new ORL/SNR Measurement feature of the Micro-OTDR SFPs measures the optical fiber link ORL during the normal Micro-OTDR start-up “handshaking” routine of the SFPs, before the data link is made. The receiver also measures the signal received. Internally the Micro-OTDR SFP calculates the actual SNR. If the SNR is deemed to be dangerously low a Warning bit is activated, and when it is too low (i.e. the optical data link bit error rate will be high), an Alarm bit is set and optionally (factory setting based on customer request) the link can be shut-down. The optical properties of Attenuation, Reflection, Reflectance, Optical Return Loss (ORL) and Signal to Noise Ratio (SNR) are important elements in describing and understanding the operation of single fiber single wavelength (SFSW) Transceivers. In order to understand and appreciate the advanced / improved link solution offered by the Micro-OTDR SFPs, we are providing a detailed definition – following up with an advanced unique solution. The loss of optical power, whether caused intrinsically to the optical fiber (absorption, scattering, micro-bends), or extrinsically by components (connectors, splices, splitters, passive CWDM filters). Expressed as dB or dB/km (when used with respect to optical fiber). The abrupt change in direction of a light beam at an interface between two dissimilar media with different indices of refraction that reflects some of the impinging optical power back into the source. Image reflection from a window (when the outside light level is low) is an example. An open UPC optical connector reflects about 4% of the power back toward the source (~-15dB reflection). Referred to sometimes as Reflectance. The proportion of light reflected from a component, such as a connector, splice, splitter, or passive filter. Expressed as -dB (negative number). The sum of the amount of light reflected from all optical fibers and components. The fiber, connectors, splices, or passive filters in an optical system can cause the reflection and contribute to ORL. Expressed as dB (positive number). The name comes from the loss encountered by the light sent into a fiber network and causing it to be reflected to the source. Pure, very long, optical fiber has an accumulated backscatter of light. Ideal long fiber has an ORL of 32 dB. For a more detailed explanation see <https://www.kingfisherfiber.com/application-notes/orl-back-reflection-guide/>. The ratio of the power of the signal received from a remote transmitter versus the power of the total reflected signals – sent by the local transmitter) – usually measured in decibels (dB). Describes the quality of an optoelectronic transmission system. Signals transmitted from the Local SFP, into the optical fiber cable plant toward the Remote SFP, lose optical energy along the way, due to scattering and absorption effects of the optical fiber, resulting in the signal arriving at the Remote SFP with a reduced optical power level. This loss of optical power is the optical attenuation (dB) of the optical fiber link. The same thing occurs in the reverse direction, in the case of bidirectional links. An element of this optical attenuation consists of the reflection of optical energy back toward each respective transmitter. Any optical energy reflecting from an individual macro-component, is called the reflectance of that macro-component, and is measured in -dB (negative number). The sum of optical energy being reflected by micro-elements of the optical fiber (impurities in the optical fiber, Rayleigh backscatter, etc. ), plus the combined reflectance of all the macro-components of the optical fiber link, make up the optical return loss (ORL) of the optical fiber link, measured in dB (positive number). It is against this background “noise” of the ORL, that the SFSW SFP receiver must discern the inbound optical data signal from the remote SFSW SFP (and vice versa). The optical power level of the inbound data signal, compared to the ORL, is the optical signal to noise ratio (SNR). If the “noise” approaches the level of the inbound data signal, the receiver will have difficulty distinguishing the “ones” from “zeros”, and errors will occur. That is, the error rate of the digital, optical fiber, communications link will increase, and the quality of the data transmission will decrease. The new ORL/SNR Measurement feature of the Micro-OTDR SFPs measures the optical fiber link ORL during the normal Micro-OTDR start-up “handshaking” routine of the SFPs, before the data link is made. The receiver also measures the signal received. Internally the Micro-OTDR SFP calculates the actual SNR. If the SNR is deemed to be dangerously low a Warning bit is activated, and when it is too low (i.e. the optical data link bit error rate is too high), an Alarm bit is set and optionally (factory setting based on customer request) the link can be shut-down. 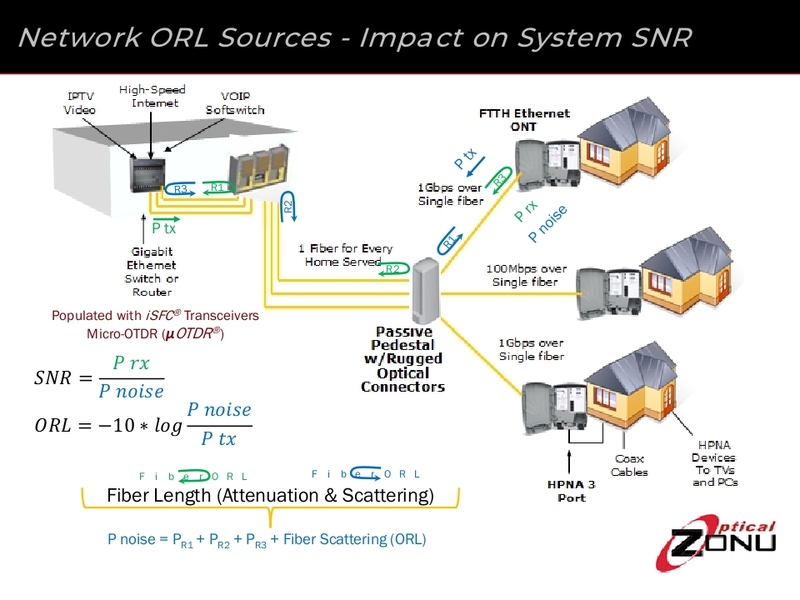 In Part II we will discuss how to exploit the new ORL/SNR Measurement feature to improve network reliability, and facilitate network maintenance, before a catastrophic network fault occurs.